Florence Jacquelin Hatcher obituary. Carnes Funeral Home. 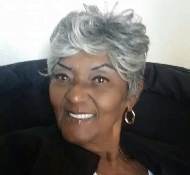 Florence Hatcher, 80, went absent of the body to be present with her Lord on July 5, 2018. Florence was the widow of Booker G. Hatcher. Florence was born in Houston, Texas. She was the daughter of William and Bertha Joseph. Florence spent most of her life as a domestic care giver. Florence was a member of Our Lady of Assumption Catholic Church in Beaumont, Texas. Florence excelled all others with her cooking skills and loved to feed her family and friends. Florence loved to be among her children, travel, shop and attend special engagements, always bringing a dish. For relaxation, Florence would visit a local game room. Florence will be remembered and missed mostly for her warm smile and giving heart. Florence was always on point when she came through with her thrift shop hauls suited specifically for our individual needs. Florence is predeceased by her husband, Booker G. Hatcher and sons, Booker A. Hatcher, Gregory Hatcher and Alexander M. Hatcher. Florence is survived by daughters, Carolyn R. Hatcher Kinlaw, Iletha M. Chinn and Laquisia R. Hatcher Fields (Ronnie) and Darla Ford (Rod); sons, Curmit T. Hatcher, Francis Hatcher and Eric B. Hatcher; her companion of 15 years, Andrew Lee Senegal along with other family and friends. A celebration of life service will be held Saturday, July 14, 2018. The rosary will begin at 1:00 p.m. followed by a chapel service at 2:00 p.m.. Both events will be at Carnes Funeral Home, 3100 Gulf Freeway Texas City, TX 77591. 409-986-9900. www.carnesfuneralhome.comThere will not be a repass following the services. All memorials may be sent to the funeral home.